Professor Avinash Kamalakar Dixit, who was awarded the Padma Vibhushan this Republic Day, tells Prasanna D Zore/Rediff.com about the dangers confronting the Indian economy. 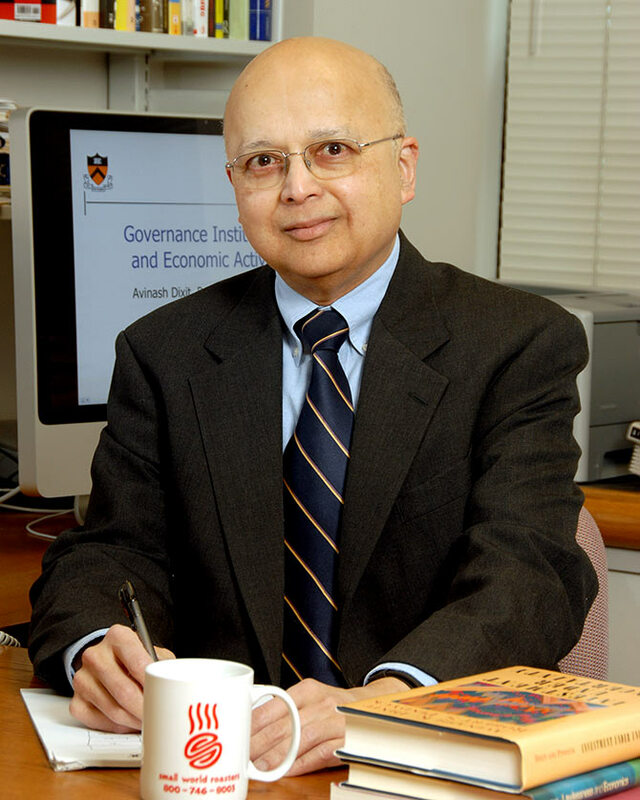 Dr Dixit, who finished his graduation in mathematics and physics from Bombay University in 1963, his BA in mathematics from Cambridge in 1965 and his doctorate in economics from the Massachusetts Institute of Technology in 1968, is the John J F Sherrerd '52 University Professor of Economics Emeritus, 2010, at Princeton. Could you tell us about your Mumbai days and your journey from then till now? I remember Bombay (as we old residents still think of it) as a vibrant but clean and pleasant city. I think on the whole it has changed for the worse: Too crowded, too noisy, too dirty. And it is much hotter, at least five degrees Celsius warmer than I remember. I was educated at the Aryan Education Society's high school, Jai Hind College and St Xavier's College. I am happy that despite the xenophobic and Jesuitical connotations of these names, none of these institutions attempted to drill any jingoism or doctrinaire religion or intolerance into me; they just gave me a good education especially in math and sciences. Tell us about your love for economics and your interactions with economists like Paul Samuelson, Robert Solow and many more you must have come across in your quest to learn economics? Which economists have had the profoundest impact on you? Then I went to Cambridge and did the Math Tripos. I like math and found in economics an ideal way to use it -- a combination of rigorous analysis and interesting social questions. I was lucky enough to be in the MIT graduate programme, where people like Joe (Nobel Prize winner Joseph) Stiglitz and George Akerlof were a couple of years ahead of me, and ones like Stanley Fischer and Robert Shiller a year behind me. One learns as much from fellow students as one does from professors. Samuelson and Solow were, of course, outstanding teachers and mentors. To learn from Samuelson you had to have read the basic textbook material in advance. Then from his lectures you got the subtleties and glimpses of how he thought; those stayed with you in your own research skills and habits. Solow was the best lecturer I have ever had the pleasure to learn from. Not only was he always crystal clear, but he also made even very abstract and dry material interesting. Later I learned game theory from reading all of Thomas Schelling's books. There are people who prove theorems in game theory, and there are those who live game theory. Schelling teaches you how to live game theory. So those are the three who have had the most impact on my thinking and research style. Were you expecting the Padma Vibhushan? Not at all. I did not even know I might be eligible. For one, not being a citizen. What was your reaction when you heard about the Padma Vibhushan? What was the reaction in the family? Pleasure, of course, but mostly surprise. The reaction I received from the family -- many cousins, nephews and nieces -- was a bunch of congratulatory e-mails. In fact, that is how I heard of the award. I had been stuck in Munich after a conference because a big snowstorm on the East Coast led to cancellation of return flights for two days. I returned to a flooded e-mail Inbox. How has life changed, if at all, after the recognition from the country of your birth? Would you believe, after the amazing and almost imperial splendour of the ceremony, life settles down to much the same tempo and routine as before. As an economist, could you describe your assessment of the Indian economy? The Indian economy has lot of strengths. Its high-tech sector is, of course, very valuable. And much hope is placed on the demographic dividend -- the large fraction of population of working age -- it will enjoy in the coming decades. But there is a great danger that it will waste this dividend, for two reasons: The poor quality of education, and the low rate of female participation in the labour force. Unless something is done quickly to remedy these problems, India will just have a large population of low-skill, low-wage, males trying and failing to feed their families adequately. Moreover, India's infrastructure is very poor compared to that in China and some other countries, and the quality of economic governance -- protection of property rights and enforcement of contracts -- is also problematic. Unless these deficiencies are remedied, it will be difficult for the country to attract investment, and it may lose out to many other developing countries in a race to attain middle and high-income levels. If you were to outline three important reform measures that could help the Indian economy become more resilient to external shocks, what would they be? a. Education that imparts a flexible set of skills. b. Labour markets that avoid rigidity, but accompanied by social measures like retraining and safety nets that ameliorate the impact on individuals of job loss. c. An independent central bank led by a competent and confident economist (and India is indeed lucky to have Raghu(ram) Rajan. Your name has often come up as a contender for the Nobel Prize in economics. Could you tell us how have you looked at the Nobel prize for economics? The thing most people don't realise about the Nobel Prize is that it is given for a body of work on a specific topic; not to a person for his/her lifetime's cumulative contributions. My style of research is unsuitable for that. I get interested in different topics and switch every few years. If I wanted a Nobel Prize, I should stick to just one area within economics for a very long time. So don't hold your breath! I don't think the prize committee has ever been guilty of an error of commission (giving the prize to someone who didn't deserve it). But I think they can be accused of some errors of omission, and I don't mean with regard to myself. Jagdish Bhagwati, probably jointly with T N Srinivasan, surely deserves one for work on the theory of ranking different policies to tackle economic failures. So does Dale Jorgenson for his work on investment and productivity. And my greatest regret is that Robert Wilson has not got one for his pathbreaking work on bidding mechanisms and auctions. Hopefully, these omissions will get corrected in the next few years. Is the American economy headed for another severe recession, as many economists have been predicting? Is there any basis to their statements? As Niels Bohr and Yogi Berra both said, 'Prediction is difficult, especially about the future.' And I am no macroeconomist. So I will pass on this one. I was asked to speculate what the world economy will be like in 100 years (this was published in In 100 Years, editor Ignacio Palacios-Huerta, MIT Press, 2015). I attach a PDF of my essay. You can pick anything from my 'dream scenario' which is intended for the world but, of course, applies equally to India. In my dream world, the political institutions of economic governance, and indeed politics as a whole, will be contentious but with civility and respect. People will debate others who hold opposite views, but will not think that those differing views automatically make the others traitors or devil-worshippers or communists or whatever may be the favored condemnable category of the day. I believe that one of the most important ideas to emerge in the eighteenth century was that of "His Majesty's loyal opposition" in Great Britain. This recognised that the Opposition in parliament could criticize and challenge the actions of the government of the day, without their basic loyalty to the monarch and the State being thereby called into question. This permitted the scrutiny and dissent that was essential for the functioning of democracy, and for reducing the risk of emergence of absolute rule or tyranny. Such loyal opposition, not only in legislatures but also from media, non-governmental organizations and other social groups, is more necessary than ever in today's world where control of information and technologies of coercion can put dangerously great powers in the hands of governments. I dream that we will all have several concentric circles of loyalty: To our family and friends, our social groups, our nations, our international organisations, and to humanity as a whole. But we will all retain a spirit of loyal opposition, keeping those to whom we delegate some power of authority over us always on their toes. How might my dream scenario be implemented? The ideal path would be one where everyone wakes up tomorrow morning, realises what needs to be done, and contributes to bringing it about with a cooperative spirit and good will. But alas, the likeliest path is through a deep crisis. As Mancur Olson pointed out (Mancur Olson, The Rise and Decline of Nations: Economic Growth, Stagflation, and Social Rigidities, New Haven, CT: Yale University Press, 1982), reforms of institutions often come about after a war or some other crisis has dissolved the previously entrenched coalitions and destroyed the power of special interests. Therefore my dream scenario may follow one or more of my nightmare scenarios. My seemingly disconnected thoughts in this essay may, after all, constitute a coherent narrative of the economic history of the coming century! Will we move to a fifteen-hour work week? Will we be another four or eight times as rich as we are now? Will we colonise the moon or mars? I don't know, and don't much care. I believe that the improvements in institutions and organisations that figure in my dream are much more important than any increases in leisure or any substantial increases in material wealth in today's first world. With good institutions, a good level of economic well-being can be sustained; without them, even great wealth can be fragile. I do hope that today's poor world catches up with the standard of living that prevails in many of today's advanced countries, and that the currently rich countries retain their level of economic well-being. Advances beyond that would be nice, but they are not my biggest hope or concern. Jim Rogers: If Mr Modi can't reform India, who can?